Press this button on the lower bar to open the Options screen, where there are various options to control the game behaviour. These options are grouped in 7 pages, use the big buttons “<<” and “>>” near the screen borders to change page. When a “v” appears inside an icon, the option is enabled. To enable/disable an option, press on the icon on the left or on its description. 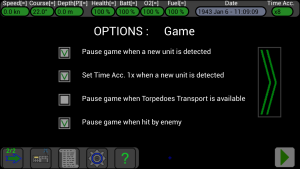 Enabled : When the U-Boat detects a new unit, the game is automatically paused. Disabled : When the U-Boat detects a new unit, the game continues without pause. This option (enabled) is especially useful when the game runs with a big Time’s Acceleration (es. 512x), because in the time between when a new unit is detected and when the player presses the pause button, the new unit can travel a great distance and get close in an instant. Enabled : When the U-Boat detects a new unit, the Time’s Acceleration is set at 1x. Disabled : When the U-Boat detects a new unit, the Time’s Acceleration does not change. When (at big Time’s Acceleration) a new unit is detected, the game pauses; if the player forgets to lower the Time’s Acceleration and presses the play button, the game runs with the same big Time’s Acceleration and the new unit could get close in an instant ! With this option enabled, after each new detection the Time’s Acceleration is automatically set at 1x. Enabled : When the Torpedoes Transport becomes available, the game pauses. Disabled : When the Torpedoes Transport becomes available, the game continues without pause. When there are a lot of enemy ships near the Torpedoes Transport, it usually stays at big depth for a long time, and occasionally rises at surface. You can call it with the radio only when it is at surface, so probably you will have to wait a lot. If you enable this option, you can set a big Time’s Acceleration and press the play button, the game will pause automatically when the Torpedoes Transport will be at surface and available. 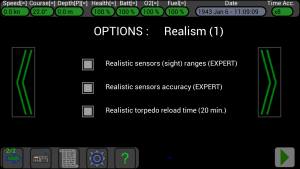 Note: this option is available only in the Full version of the game; in the Demo version the Torpedoes Transport is not available. Enabled : When your submarine is hit by an enemy, the game pauses. Disabled : When your submarine is hit by an enemy, the game continues without pause. Normally this option is enabled, when you are hit by a enemy ship’s cannon or aircraft’s gun, the game is paused giving you the time to think at what to do to not receive other shots. In other situations, for example when you are using your AA gun to attack an enemy aircraft, these breaks can be boring and can be avoided by disabling this option. Enabled : The circles indicating the instruments’ ranges are drawn on the map for all units, and the circles indicating your visual, radar and guns ranges are drawn even if your U-Boat is not at surface. Disabled : Only the circles indicating the instruments’ ranges of the selected unit and of your submarine are drawn; if you select your U-Boat and it is not at surface, the circles for your visual, radar and guns ranges are not drawn. This option (enabled) can be useful when there are a lot of units around your U-Boat, and you want to see all the circles on the map. Enabled : The circles indicating the instruments’ ranges of your submarine are drawn on the map, but the circles indicating your visual, radar and guns ranges are drawn only if your U-Boat is at surface. 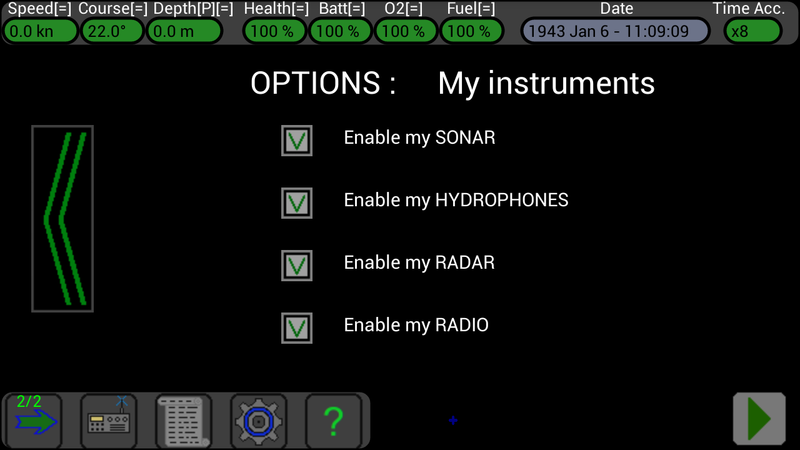 Disabled : Only the circles indicating the instruments’ ranges of the selected unit are drawn; if you select your U-Boat and it is not at surface, the circles for your visual, radar and guns ranges are not drawn. This option (enabled) can be useful when you want to see the circles of your submarine on the map, either if it is not selected. Enabled : the map’s background is always dark, as if it were night. Disabled: the map’s background changes color during night, day, sunset and sunrise. Normally the map’s background color changes during day, enable this option if you want to preserve the device’s battery or to relax your eyes. Use the “-” and “+” buttons to reduce or enlarge the Font used in the Info panel (the Info panel is shown on the left of the screen when a unit is selected) and in the Log Screen. 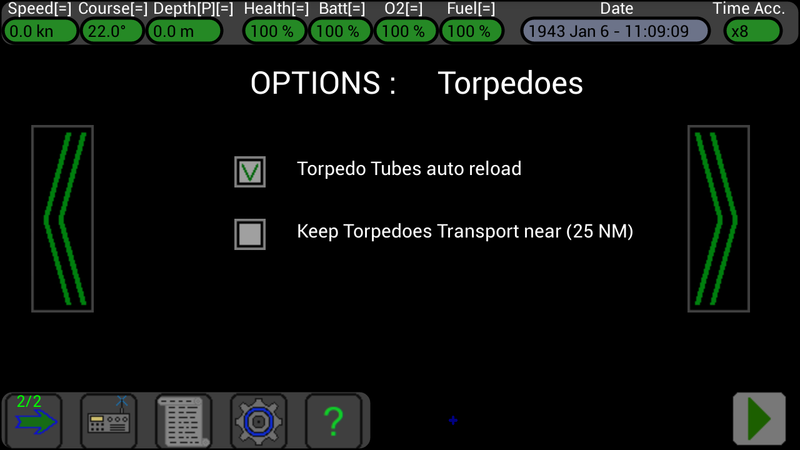 Enabled : when a torpedo is launched and an other torpedo reserve is available, its tube is reloaded automatically. Disabled : when a torpedo is launched, its tube remains empty. This option (enabled) is useful in the middle of a battle to not forget to reload the torpedo tubes. Note: if all tubes are empty and other torpedoes reserve are available, the frontal tubes are reloaded in this sequence : F1-F2-F3-F4. If you have few torpedoes reserve and want to reload first the F3 tube, disable this option before launching torpedoes and reload the F3 tube manually (using the button near the tube F3 in the Torpedoes Screen). Enabled : the Torpedoes Transport will follow your U-Boat at a distance of 25 NM. Disabled : the Torpedoes Transport will remain in its position. If you have a lot of enemies around and you want to replenish often your U-boat, you can enable this option to save time between each replenishment. Otherwise, if the Torpedoes Transport is in an other zone if the map, you could wait a lot for it to come near, when called with the radio. In other situations, it could be useful to keep this option disabled, for example when you want the Torpedoes Transport to stay in an other zone of the map for reporting other units with its radio. Enabled : sounds are played. Disabled : all sounds are muted. This option (disabled) can be useful to not disturb other persons…. Enabled : the terrain is shown with high resolution. Disabled : the terrain is shown with low resolution. To avoid using a really large amount of memory in your device, the terrain’s points are interpolated in real-time when the map is moved or zoomed and this intensive task could cause a slowdown of the user interface; it is possible to reduce this effect by disabling this option and the terrain will be drawn at a lower resolution in the map. 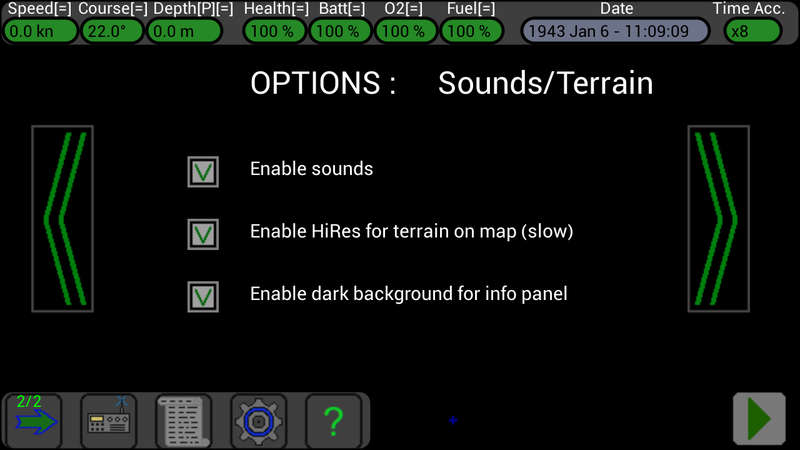 Enabled : the info panel is shown with a dark background. Disabled : the info panel is shown with a dark background. When this option is enabled, the info panel for the selected unit is shown inside a panel with a dark background; this can be useful when the terrain is shown in the map and its colors make the text of the info panel less readable. Disabled : all units have standard (short) visual ranges. Enabled : all units have advanced (long) visual ranges. Normally, with this option disabled, the game is a little more easy and simple, the visual ranges are short and this give you more possibility to remain invisible. A table with all ranges will be added on this web site as soon as possible. In future there will be different ranges for all instruments, not only for the sight, and they will change depending on weather conditions. Note: this option is available only in the Full version of the game; in the Demo version this option is always disabled. Disabled : all units’ instruments (radar, sonar, sight, hydrophones, radio) detect the other units at their exact distance, bearing, heading, speed and depth. 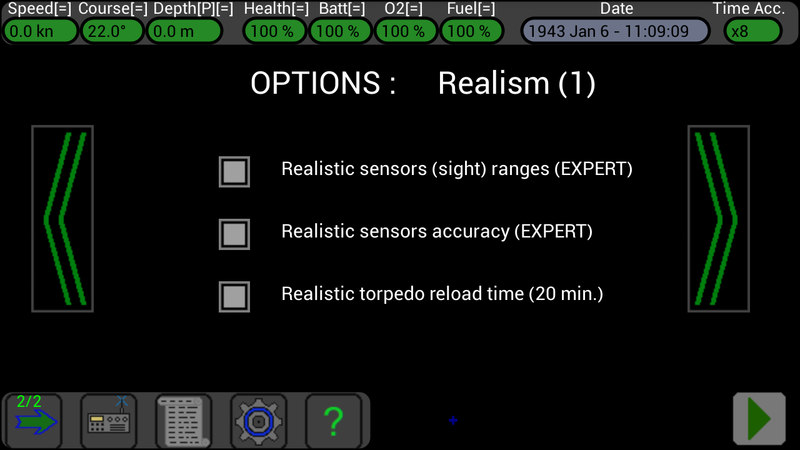 Enabled : all units’ instruments are less accurate but realistic. 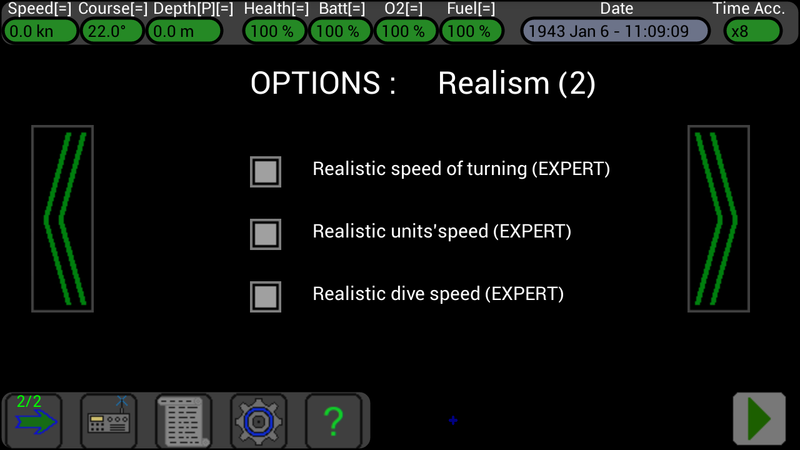 When this option is disabled the sensors detect the exact position, range, bearing, speed, depth and heading of the other units, it makes the game more easy (but not so much realistic). In the information panel now there are shown both these values and the ranges, between ““. Note: this option works well but sometimes can cause problems to the Torpedo Transport, when approaching your sub; if you encounter problems, please disable this experimental option before linking to the refuel sub. Note: with this option enabled, when a sensor of your submarine detects an other unit, it is put on the map in the “middle” of the range, with an average heading, speed and bearing, to reflect the uncertainty of the detection; if a unit is far and your sensor stops to detect it, this unit is printed on the map with a dashed symbol and its position is calculated using the last detected position, heading and speed; when your sensor detects again this unit, it is printed on the map again “in the middle of range” and the unit seems to jump… it is not nice but normal, if you want you can temporary disable your instruments in the “My instruments” option page to stop this behavior. Disabled : The torpedo reload time is 5 minutes. Enabled : The torpedo reload time is 20 minutes. When this option is disabled, the torpedo reload time is short and makes the game more easy. When this option is enabled, the torpedo reload time is more realistic and long, this will force you to not waste your torpedoes and to better design your attacks. Disabled : the speed of turning of all units is fast. Enabled : the speed of turning of all units is slow and more realistic. When this option is disabled the game is more easy, your speed of turning is fast and it is easy to escape from enemies. When this option is enabled the speed of turning of all units is slow, it makes the game more realistic, difficult and funny. Disabled : all units can run at half of their max speed. Enabled : all units can run at their max speed. When this option is disabled the game is more easy, units are not very fast. When this option is enabled all units can run at their max speed, it makes the game more realistic, difficult and funny. Note: this option does not affect your submarine, it can run always at its max speed (when it is not damaged…). Disabled : your dive speed is fast. Enabled : your dive speed is slow and more realistic. When this option is disabled the game is more easy, your dive speed is fast and it is easy to escape from enemies. When this option is enabled your dive speed is slow and proportional to your speed, it makes the game more realistic, difficult and funny. Enabled : your instruments are enabled and working. Disabled : your instruments are disabled and can not detect other units. In the old versions of the game your instruments were always active. Note: “sight” is not included here, to disable your sight go below the surface and lower your periscope. 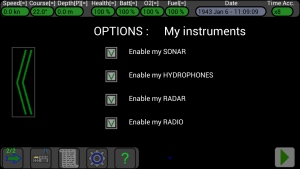 Note: this option is available only in the Full version of the game; in the Demo version all your instruments are always active.